What is OZONE .Ozone is . . . . . . Stable design, made of rugged molded polyethylene. Thisfogger is great for duct sealing, deoderizing and disinfecting.Suitable for applying water or solvent based formulations. The ULV features means that extremely small particle sizescan be produced. Features include adjustable flow control valve, 1 1/2 gallon tank, 48" supply hose, variable output from 0 to 18 ounces per minute and fingertip output control. The Electro-Gen produces "DRY FOG" on the order of smoke itself rather than the damage causing wet particles produced by conventional mister and foggers. Remove the barrel and the Electro-Gen also can be used as an electric sprayer to apply solvent or water base chemicals for deodorizing, disinfecting, fabric protecting, etc. 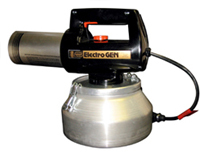 The Electro-Gen converts one ounce of Thermo-55 into a 2,000 cubic foot deodorizing cloud. The Thermo Gen® works incredibly fast, up to 1 million cubic feet may be treated in an hour. 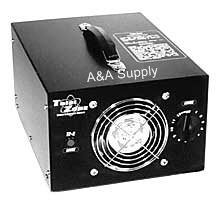 A thermal fogger is an absolute necessity for complete neutralization of smoke and other odors. Produces a true dry fog at a particle size of .25 to 50 microns. Small particle size allows complete penetration of contaminated surfaces as well as reduction of airborne odor particles. The fog produced by the Thermo Gen ® follows the same path as smoke and odors, reaching into cracks, crevices and voids. Durable stainless steel construction. Fogs solvent or water based solutions. The Thermo-Gen® can fog 0-14 gallons of water or oil-based counteractant, such as Thermo-55®, or Thermo-2000® per hour. Gasoline powered.